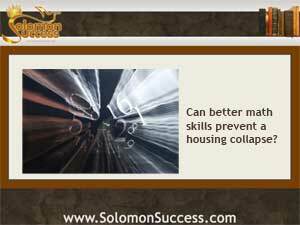 Solomon Success > Blog > Can Math Skills Help the Housing Recovery? The wise King Solomon believed that knowledge is the basis of wisdom. And wisdom, as he sys in Proverbs 1:5-6 and many similar verses, leads to power and prosperity: “A wise man shall hear, and shall be wiser; and he that understandeth shall possess governments.” According to a new study conducted by researchers at Columbia Business School, knowledge of a certain kind — math skills – can help people possess, if not governments, at least their own homes. According to CNN Money’s new report on the study, researchers surveyed a large sample of hundreds of homeowners who took out mortgages just before the housing meltdown of 2008, and tracked the outcome of those mortgages after the collapse. Their finding? A quarter of the subjects who scored lowest on basic math skills had defaulted within five years of taking out the mortgage. That compares to only five percent of those in the highest percentile for math.